The location was on Wisconsin Avenue in Washington DC, very close to the Maryland border. The "Take It!" came as I was on my usual drive route on my way into the heart of downtown Washington DC, and noticed what looked to be a yard that had been either trashed or the sight of a night before party. Fortunately it was a part of the latter, as it was the site of a polling place from the day before which was election day. While it may look in part like a mess - it actually is beautiful, as it is a confirmation of a location where we engage in our Democracy by voting. I marvel at how all of this works. 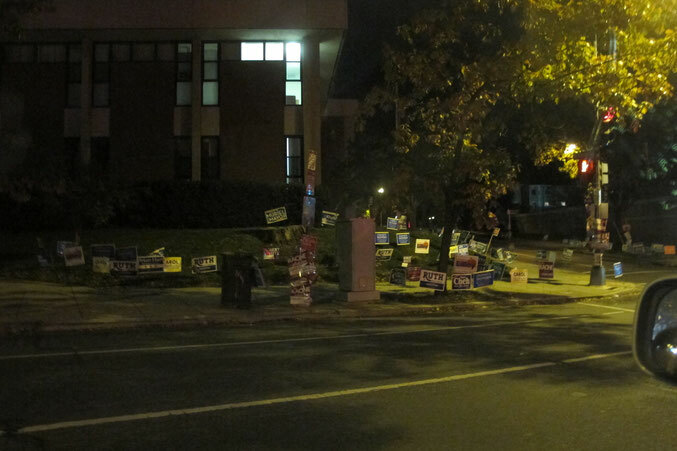 There is always a certainty that on the day of voting there are going to be a crowd of signs posted wherever they can be legally positioned, as close to the door of the voting place as possible. This attempt at one last chance to persuade a vote in one direction or another is a part of our privileged process. What is not shown in this photo, are the party or purpose faithful, who stand outside these voting places in very carefully designated locations with their small tables, which hold informational materials on a candidate or a subject being voted upon. These highly dedicated folks are out there, staffing the sites in no matter what the weather. Each has their own way of being convincing or confirming and even though they stand immediately next to one another, a civility is always in place. Even though I might not agree with one side or the other - I still give each of them with whom I may have eye contact on either my way in, or out of the poling place - a smile and sometimes my thanks for being there. This small bit of encouragement is important to them, as it is to me as well. So, at this very early sighting on the morning after the big vote - I am always inclined to think "bless the mess" for it is evidence of just one more of our freedoms. Our Democracy is a work in progress - I constantly maintain hope that it is in the best direction for all. Please vote when ever this privilege is offered. I wonder if people just close their eyes and point, then vote for whoever they landed on. Unlike some, *ahem* Sally, I take the tradition seriously. This is the politicians equivalent to how some of my students cram for tests. Just load up at the very last moment. While it does look messy on the surface, it makes me proud to be an American. I didn't get the opportunity to vote this go around but I will look forward to the next. It is a habit I want to establish while I am young.